Topps is taking a chance to see if size really does matter when it comes to baseball cards. Taking a page from 1975 Topps Mini Baseball, the card maker has brought the concept back for 2012 Topps Mini Baseball. Paralleling the 2012 Topps Series 1 and Series 2 Baseball set, the cards offer a smaller spin on the flagship set. Sold initially exclusively through the online Topps store, 2012 Topps Mini Baseball has a 661-card base set. 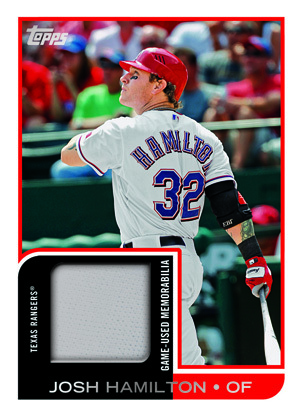 Included are card of rookies like Bryce Harper, Yu Darvish and Brett Lawrie. Card fronts and backs mirror the flagship sets they're based on. However, the cards are smaller, measuring 2 1/4" by 3 1/8". The release doesn't have a ton of inserts, but one autograph or relic card is promised in every box. 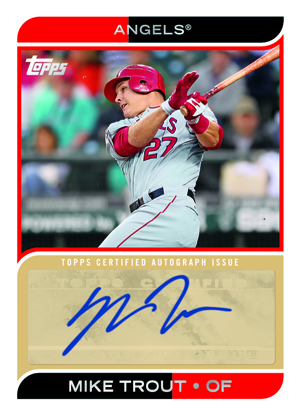 Harper, Darvish and Mike Trout are all on the 31-card autograph checklist. Hall of Famers Frank Robinson, Tony Gwynn and Stan Musial are also among the signers. The cards use sticker autographs. The 50-card relic checklist includes a broad mix of past and present stars. The base set has three parallels: Gold (#/61), Platinum (#/5) and Printing Plates. Golden Moments are the only other inserts. Topps is promising a limited print run for 2012 Topps Mini Baseball. Boxes come with 24 packs of ten cards. 2012 Topps Mini Mike Trout Autograph #MA11 9.0 MINT. RARE! 661 cards. Cards are mini versions of those found in 2012 Topps Series 1 and Series 2 Baseball. 31 cards. Either one Autograph or one Relic Card inserted per box. 50 cards. Combined with Autographs, inserted one per box. very nice set very limited good insert (auto,and jersey check list,hit a gold jeter#’ed to 61,a press plate,and a card #ed 5/5 in 1 box,would have been nice to hit an sp if there are any?